Traces of 18th and early 19th century routes and settlements, and scattered farmsteads, can still be found, but since the 1960s, when the Vernacs first travelled these roads, there has been almost total loss of the more fragile buildings constructed of reeds and unbaked clay that were typical of the region. (See VASSA Journal 23 2010). 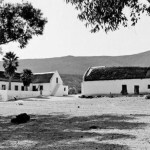 During the 19th century the key to success for Piketberg farmers was to diversify between livestock, grain farming and fishing as well as trading between the interior and the coast. But most of the few surviving buildings, such as at Verlorenvlei, have been renovated, remodeled, restored or rebuilt and their original fishing/farming context has often been forgotten or disappeared.